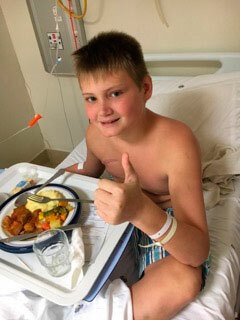 Kerry Moller, aunt of Robbie Eddles is appealing to donors to assist her nephew who recently had his third relapse with Acute Lymphoblastic Leukemia. Robbie was first diagnosed at the age of five and then at 12 and now again at 17. 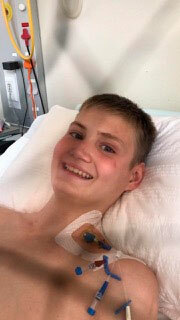 “It has been a very long journey of this brave boy who has beaten it twice and just as his family and friends thought his battle was over, he has just relapsed again,” said Moller. She said sadly, no bone marrow match has ever been found despite tireless efforts to try and organise donor drives all over SA. “At this stage, we are running out of time and options fast and it seems that his oncologist who has treated him for the last 12 years is leaning towards CAR- T therapy overseas which cannot be done without a donor in the wings,”said Moller. Last week, Moller visited Westville schools for a donor drive taking samples from those who would be willing to donate. “Fortunately, being registered with the South African Bone Marrow Registry (SABMR) there are new swab kits which are amazing and they will even come to your door and collect. We desperately need to get donors flooding in as well as to raise some much needed funds for SABMR. Even if we never find a match for Robbie, growing the registry has always been Robbie’s biggest wish as he has lost so many friends to Leukemia over the years,” said Moller. She is urging those who wish to assist to get in touch with her. “Please let me know if any of you can help in any way. Businesses, schools and individuals can contact me directly, SABMR will come to you. Also if any corporates, individuals are happy to donate funds towards SABMR it would be hugely appreciated,” she said. Moller said through the interaction on Facebook, many donors have made applications. “On Friday, 8 February, the SAMBR told me that we have just passed over 7000 new donor applications in a week, SA is on fire,” she said.